Video communicates your offer unlike any other market medium. Video brings your product or service to life with demonstrations, testimonials and benefits in action. It’s a powerful way to deliver your message to prospects—and generate leads and sales. Video also lends credibility to your offer, a critical key to earning the trust of potential customers. After creating hundreds of videos for clients, I’ve developed specific strategies and insights for creating effective, response-boosting video content. Rule #1: The first few seconds of your video are key. You’ve got to capture the attention of your prospect immediately. It’s easy to skip a video, so make sure the first few seconds are powerful, and deliver your message clearly. Don’t start with a fade-in from a black screen—instead, use vibrant, colorful images to immediately engage the viewer. Rule #2: Use only direct response copy and art in your script. Your script should have one clear theme. It must be benefit-oriented and guide your viewer through the principles of AIDA: It should draw attention, attract interest, develop desire and compel action. Remember, the video needs to use direct response copy to produce a high response. This is not the time to use journalistic or traditional advertising copy. That would kill the sale. Your video is a story designed to get people to buy your product or service, or generate that lead. No reverse type: White text on a black background decreases readability and response. Readability: Make sure that any text is easy for your prospect to read and understand quickly. Bullet points are an effective way to communicate information quickly. Avoid navigation distractions: Don’t distract your viewers with options to navigate away from the video. Your video has one goal: to drive prospects to respond to a call-to-action (CTA). Rule #3: Use a credible spokesperson to demonstrate benefits. Seeing the benefits in action—and hearing the opportunity discussed by the spokesperson—are powerful. A spokesperson can be more effective than sheer entertainment … but that doesn’t mean your video can’t be fun. For example, I cast a 4-year old as “the world’s greatest investment trader” in a client’s online video. It was entertaining, informative and effective. Rule #4: Repeat your unique selling proposition (USP). Just as you should feature your USP at the beginning, in the middle and at the end of every print campaign, you also need it in your video. Be sure it’s consistent with the rest of your branding and collateral materials. Rule #5: Don’t distract your viewers. Don’t distract your prospects with effects or details that might be “entertaining,” but don’t cause them to respond to your offer. Keep your video simple. It should clearly communicate your Unique Selling Proposition (USP) and compel your viewer to action. Rule #6: PowerPoint v. action. The video style that is the most effective for a target audience is a video with PowerPoint words, or something called a “storybook” video. Using text with video increases retention and response. Whether you’re using a live personality or a PowerPoint, you can use on-screen text to lengthen the time that a prospect will watch a video—and how likely they are to respond to your offer. Make sure that the words properly reflect what’s being said, are easy to read and stay in one location. Facebook actually says that using printed words increases video engagement by an average of 12%. If you’re not sure how to add text to your video, Facebook has a tool that makes it easy to add word captions to your videos. Rule #8: Use testimonials and/or reviews with ratings. Testimonials are one of the most powerful sales tools in existence. But remember, prospects want to see real people who like your product. Showing a person who is not a professional actor or model—someone who seems uncomfortable and whose story is not overly rehearsed—actually increases your response. When you’re filming customer testimonials, shoot them several times so you can edit exactly what you want from the answers. IPhone testimonials are great, too! Rule #9: Connect the script with the prospect quickly and dramatically. Like the copy you use for direct mail, email and other marketing materials, a powerful direct response script will hit hard immediately. Drama. Suspense. Surprise. No warm-up. No introduction. Command attention. Remember…47% of the value of a video is delivered within the first three seconds, and 74% in the first ten. Do not be afraid of a longer video. Some of the most powerful videos are 12 minutes long. When considering video length, ask yourself the following questions: How complicated are your benefits to explain? How easy is it to overcome objections? For a typical marketing campaign, I normally create a 3-12 minute video. Rule #11: Get a model release. Always get a model release from those you’re filming so you have the right to use your footage wherever you want to, whether that be on your landing page, Facebook, banner ads or elsewhere. You may also want to use footage in creative ways – for example using a still photo and an excerpt from the testimonial in a brochure. Rule #12: Have a strong call-to-action (CTA). Your job is to make it as easy as possible for the viewer to respond … whether you show a phone number, email address, URL or mailing address. Rule #13: Graphics add power. The addition of graphics in the right places will increase viewer retention and reinforce your message. Every image must reflect the value of your offer. Rule #14: Optimize your video for silent mode. Believe it or not, 85% of people watch Facebook videos on silent. That means that you’ll have to create drama and impact without relying on a voiceover or background music. Instead, communicate your message with powerful action and show important words as text on screen. Rule #15: Clean and simple win on small screens. Remember that many of your prospects will be watching your video on mobile screens. Avoid small text and detailed visuals, and keep your graphics simple and bold. This is a key detail when choosing your thumbnail image, which should be clean and bright to catch the eye of your viewers. Your title doesn’t need to be included in the thumbnail—you can attach metadata to the file when you share it online. Rule #16: The camera is unforgiving. Consider how the subjects you’re filming appear through the lens. Don’t neglect wardrobe considerations. An outrageously patterned tie or an electric blue dress can distract viewers from the content. Take extra time to see what doesn’t belong in the shot. For example, a newspaper or magazine showing a headline can immediately date your production and limit its use. Rule #17: Remember Murphy’s Law. If something can go wrong, it will. Plan, plan, plan! If you don’t bring it to your video shoot, you’re sure to need it. If you don’t have a Plan B, you’ll need one. Outline everything you’ll need, including rolls and rolls of duct tape, and take special care with cameras and other equipment that may become victims of carelessness. Look into getting insurance for the day of the shoot that includes weather, equipment and both personal and corporate liability. Rule #18: Allow for extra shots. Always shoot more footage than you need, since you’ll always need more than you thought. Even if you think a scene is “perfect,” shoot a backup so you can pick from the best material as you edit. Make time for “establishing shots”—shots that show the context of what’s being sold. Shoot “reaction shots” to show one person reacting to another’s comments. This is called “B-roll” footage, which can be invaluable during editing. Rule #19: Maximize its use. Brainstorm multiple uses for your video—as a premium, as a download or to drive prospects to your landing page. Use a screenshot of your video for emails, banner ads and native ads. You’ll want to choose a screenshot that teases with powerful words that increase click-through. Rule #20: Enlist the right crew. Remember, it was direct response marketers who perfected the infomercial. And the infomercial is still highly effective today. It’s important to use direct response marketing professionals, not video professionals or general ad agencies, to get the most out of your video. Provide a transcript of your video so that prospects have the option of reading through the video content as well as watching it. A written transcript increases the impact of the video – and multiplies response. 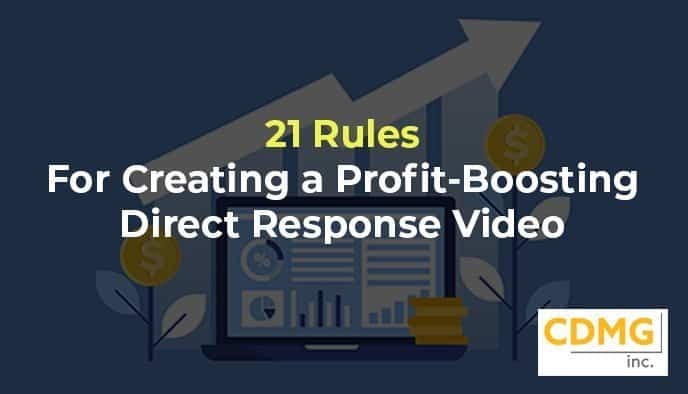 By following these 21 rules, you’ll develop an effective video that you can use for your pre-roll ads, on your landing page, Facebook ads, in your email marketing and more. I’ve created over 300 videos, including 13 infomercials. If you’d like to talk to me about how you can create a powerful video for your next multichannel, integrated campaign, give me a call at (310) 212-5727, or email Caleb at caleb@cdmginc.com.